Vienna, Austria, is filled to the brim with historical treasures and monuments. 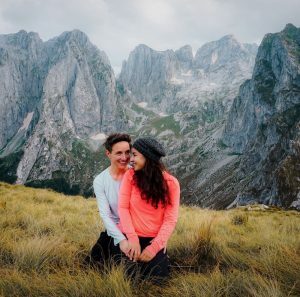 Once you’ve covered all the essential sites, like Schönbrunn Palace, St. Stephen’s Cathedral, the Belvedere Palace and the Vienna State Opera, it’s time to venture off the beaten path. Curious what gets left off most people’s Vienna itineraries? Good – us too! 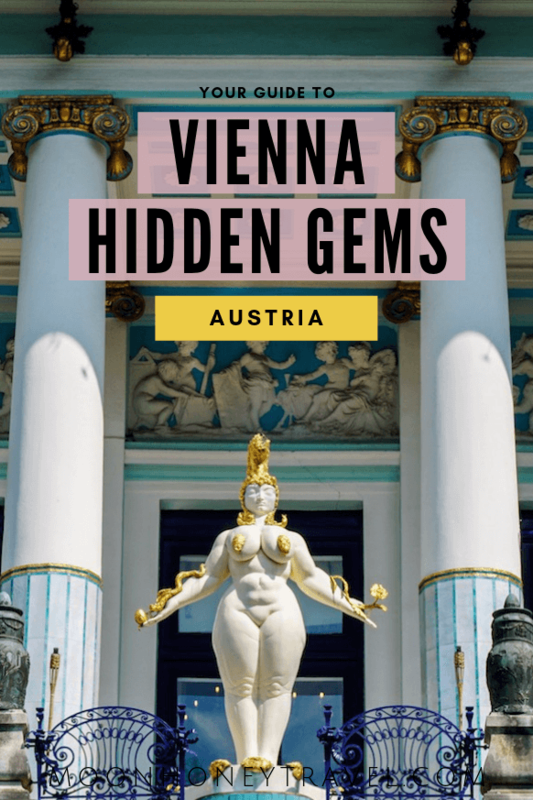 Well, we’re going to fill you in on all our favorite hidden gems and secret places in Vienna. Kati is from Vienna and I’ve lived in the city many times. So, this post is borne out of years of exploring Austria’s capital city together. 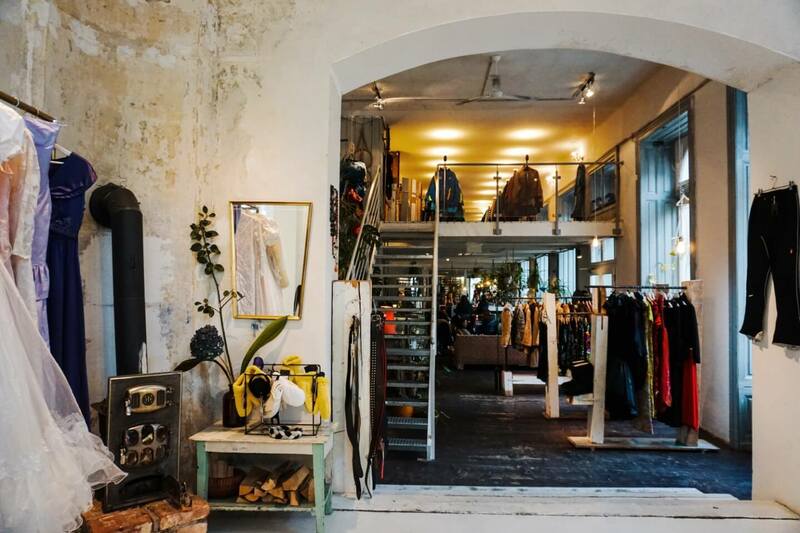 From modern architecture and wine cellars to concept stores and palaces, there’s something on this list for everyone. And, if you live in Vienna, you’ll probably discover something new too. Planning a trip to Vienna? Start with our Vienna City Guide, which outlines top experiences, where to stay, what to eat, and where to dine. And while you’re there, connect with us on Pinterest! And, why not Instagram too! Heads up: our list doesn’t include the glorious Austrian National Library (State Hall), or Palmenhaus, because these two attractions are fairly well-known. However, if you haven’t visited them, they are definitely worth seeing. 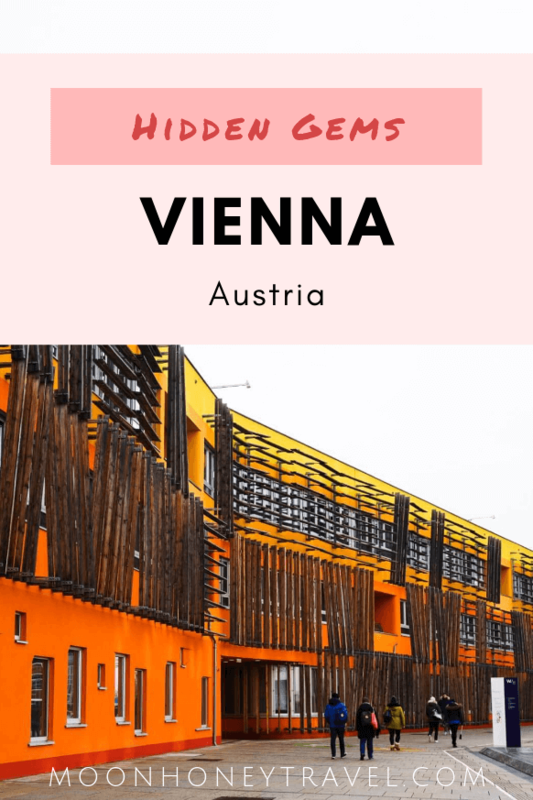 And finally, here are our favorite hidden gems in Vienna. Some of the following attractions are seasonal, so make sure to read the full description, before setting off. 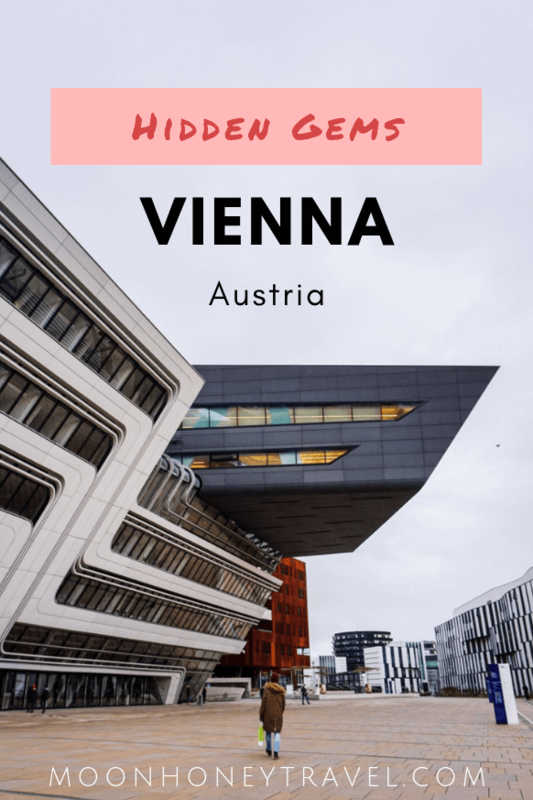 Bonus: At the end of this post, you’ll find a Vienna city map plus 3 hidden gem hotels worth staying in. If you’ve walked into a grocery store in Vienna, you’ve probably seen the memorable Schlumberger Sekt bottles. They’re the ones with the fairy logo. If you haven’t, please remedy that asap. Or, even better, head to Schlumberger Cellar World and visit Austria’s oldest sparkling wine cellars. 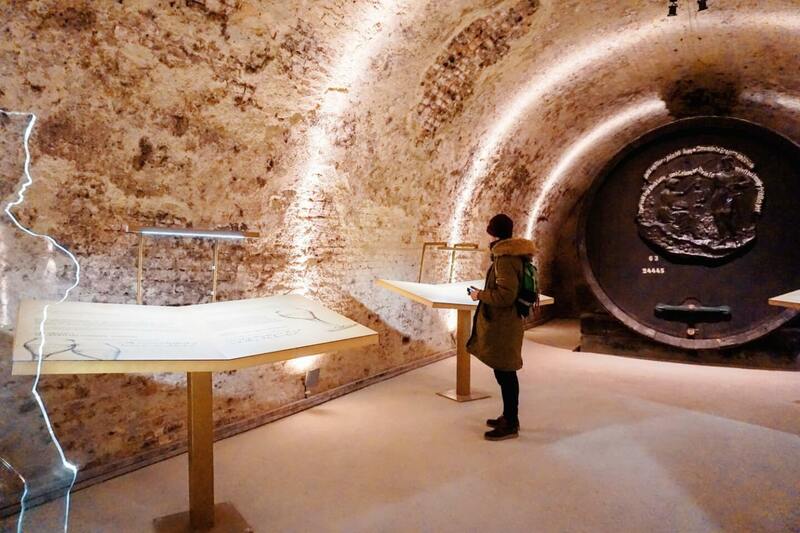 At Schlumberger Cellar World, you can take an audio guide tour through their 300-year old cellars. This excellent self-guided tour navigates you through the process of making bottle-fermented wine – the production method that Schlumberger has employed since the mid-1800s. It’s the same method used in Champagne, France. As you walk through the cellars, you’ll probably see people riddling (turning and angling) the wine bottles by hand. What makes Schlumberger sparkling wine especially unique is that all the grapes are sourced from Austrian wine growers. So, the base wine is made from blends of Austrian varietals like Grüner Veltliner, Welschriesling, and Weissburgunder as well as Pinot Noir and Chardonnay. 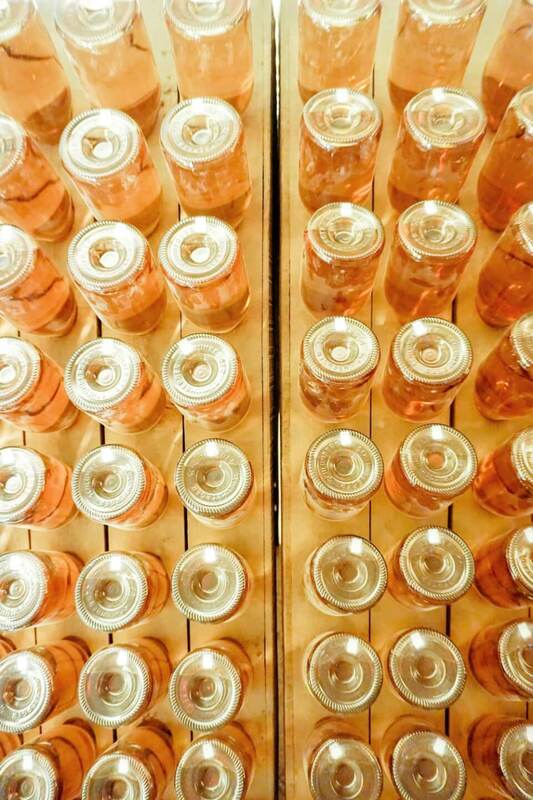 After the 50-minute tour, you can taste Schlumberger’s famous sparkling wines. If you’ve opted for the Grand Tasting and tour, you’ll sample (1) Vintage Sparkling Brut, (2) Vintage Rosé Brut, (3) Vintage Grüner Veltliner Brut, (4) Gold Secco, (5) Rosé Secco. In addition, you can try other Schlumberger specialty wines for an additional 5 EUR per glass. Bonus Tip: try the memorable Vintage Blanc de Noirs Brut. 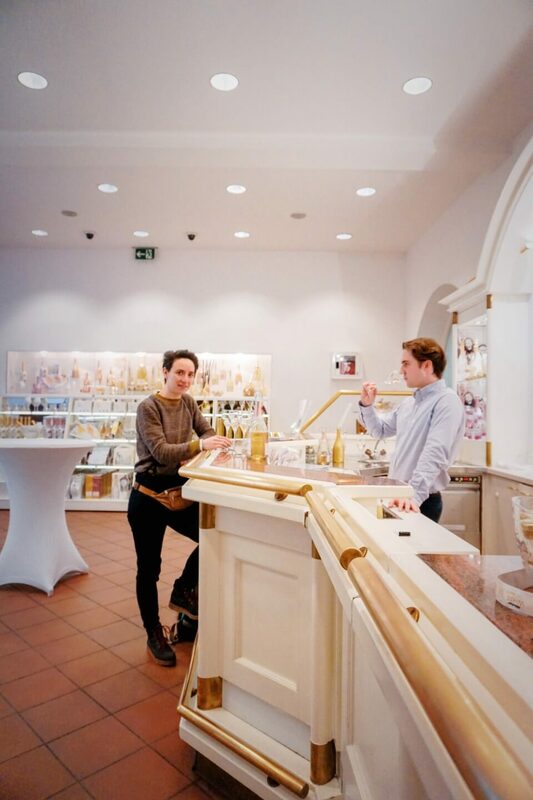 We promise that you’ll leave this Vienna hidden gem with a newfound appreciation for sparkling wine – we certainly did. The audio guide is available in 8 languages: German, English, Spanish, Italian, French, Russian, Chinese, Japanese. Opening Hours: Wednesday (11 a.m. – 9:30 p.m.) and Thursday – Saturday (11 a.m. – 6 p.m.). After the tour, you’ll be a given a complimentary glass of Schlumberger. But, we recommend selecting the Grand Tasting with the tour. That way you can taste 5 different wines. Entrance: Adults (11 EUR), Students & Seniors (8 EUR). Tour with 5-glass Grand Tasting (20 EUR). Make sure to bring your own headphones. Otherwise, you can rent headphones for 1 EUR. How to Get to Schlumberger Cellar World: Take the subway line U4, or U6 to Spittelau station. From Spittelau, it’s a 2-minute walk. Burggasse 24 is a two-floor concept store with an in-house café in Vienna’s 7th district. The name of the store is also the store’s address. We stumbled upon this unique shop completely by accident. The retail side of the store features one-of-a-kind vintage clothing items. You can tell that everything has been selected with care. If you love dressing up, hunting for unique pieces, or building your own costume, you’ve got to check this place out. I (Sabrina) was searching for a ball dress in Vienna and failing miserably to find anything I liked. However, within 10 minutes of being in 24, I found and bought a silk dress, originally made for the Vienna stage. The other side of the shop is a charming café. 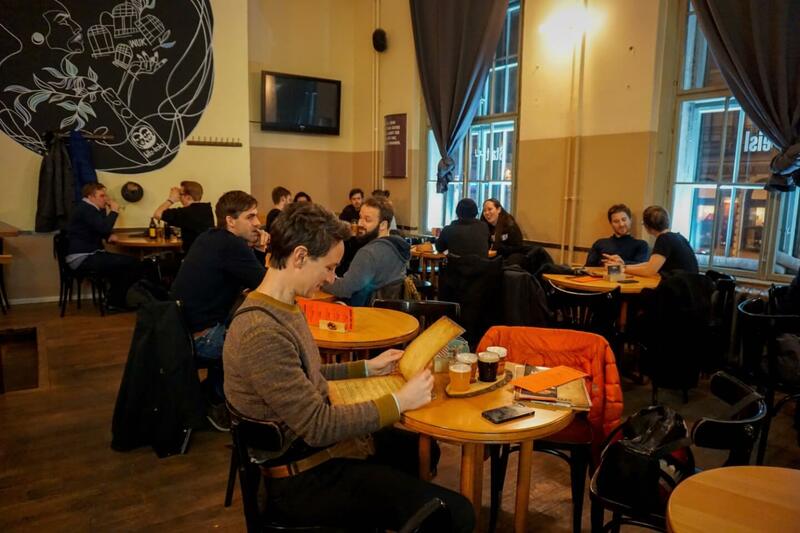 The Burggasee 24 Café is a lovely place to curl up with a book or meet your friends. It gets really busy during the weekend (especially during brunch), so make sure to make a reservation. Otherwise, come during the week. Bring Cash. The café only accepts cash. Don’t come on a Sunday. While the café is open on Sunday, the store is not. And, you definitely don’t want to miss out. Store Hours: Monday – Friday: 11:00 a.m. – 8:00 p.m. Saturdays: 11:00 – 6:00 p.m.
Café Hours: Monday – Sunday: 10:00 a.m. – 10:00 p.m.
Hermes Villa is a palace, located in Lainzer Tiergarten, the former imperial hunting area of the Habsburgs. Most Habsburg-related historical treasures are centrally located in Vienna. Hermes Villa is the exception, a true Vienna hidden gem. 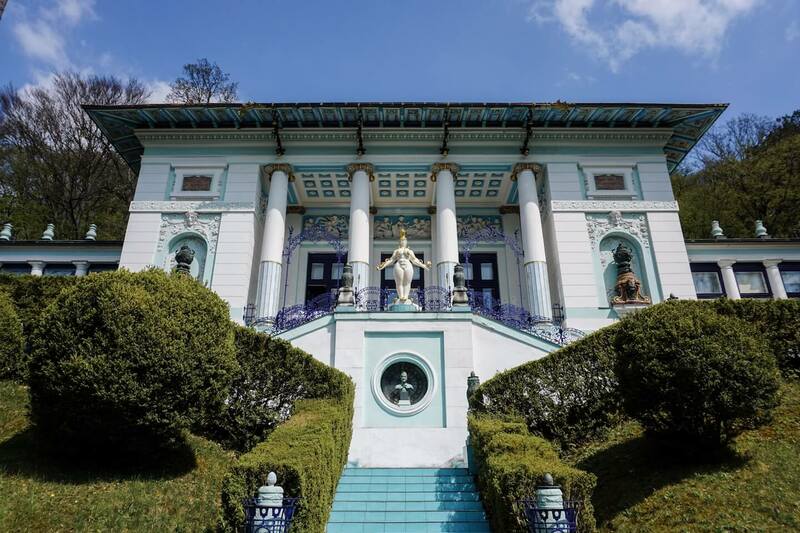 The villa was a gift from Emperor Franz Joseph to his wife, Empress Elizabeth (aka Sisi). Sisi abhorred court life and preferred to travel. In giving it to her, he hoped that she would spend more time in Vienna. She called Hermesvilla her Palace of Dreams (Schloss der Träume). The architect Carl von Hasenauer designed the villa and it was constructed between the years 1882 and 1886. He also designed the Museum of Fine Art and the Museum of Natural History along the Ringstrasse. The interior is decorated with murals by Gustav Klimt, Hans Makart, and Victor Tilgner. Tuesday – Sunday & Public Holidays: 10:00 a.m. – 6:00 p.m.
Hermes Villa closes 30 minutes before the gate of the Lainzer Tiergarten, but latest by 6:00 p.m. Sample travel itinerary from Westbahnhof (~40 minutes total): From Westbahnhof, take Straßenbahn (tram) 60 to Hermesstraße (about 25 min – 16 stops), change at Hermesstraße to the bus 55A (about 5 min – 5 stops) to Lainzer Tor. Wildlife park Lainzer Tiergarten (where Hermes Villa is located) is one of Vienna’s best-kept secrets. If you’re craving the outdoors and a long walk, this is where you should come. Just don’t be alarmed when free-roaming boars cross your path. Lainzer Tiergarten was formerly the hunting area for the Habsburg nobility. 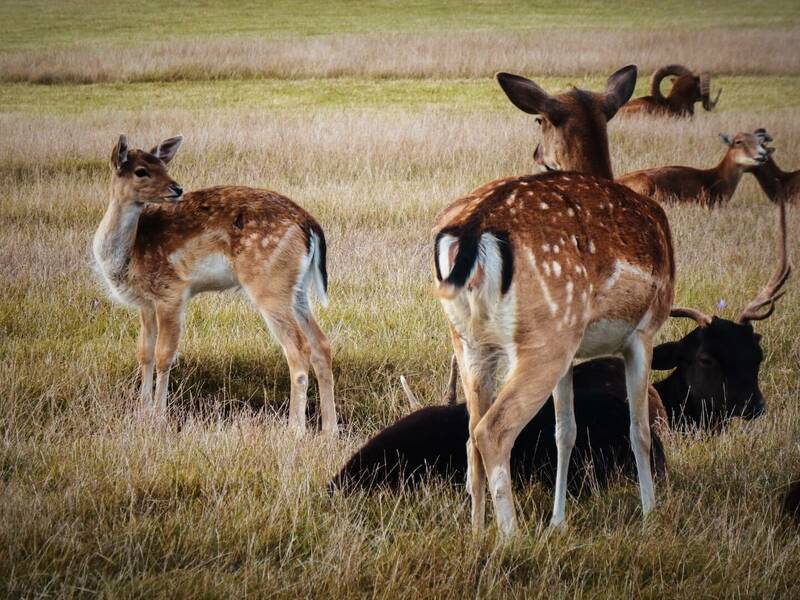 Other areas of the park feature spacious animal enclosures of red deer, fallow deer, and wild sheep. There are also forest playgrounds for children. The opening times of the park depend on the length of the day. So, make sure to consult this page, before heading out. WUK (Workshop and Culture House) is an entertainment venue and alternative cultural center in Vienna’s 9th district. This is an awesome space to hear indie and jazz bands and attend themed-parties and art exhibitions. Most importantly, WUK is a gathering place for everyone. Check out their calendar of events to find something for you. We’ve attended World Cup viewing parties here as well as progressive LGBTQ dances. 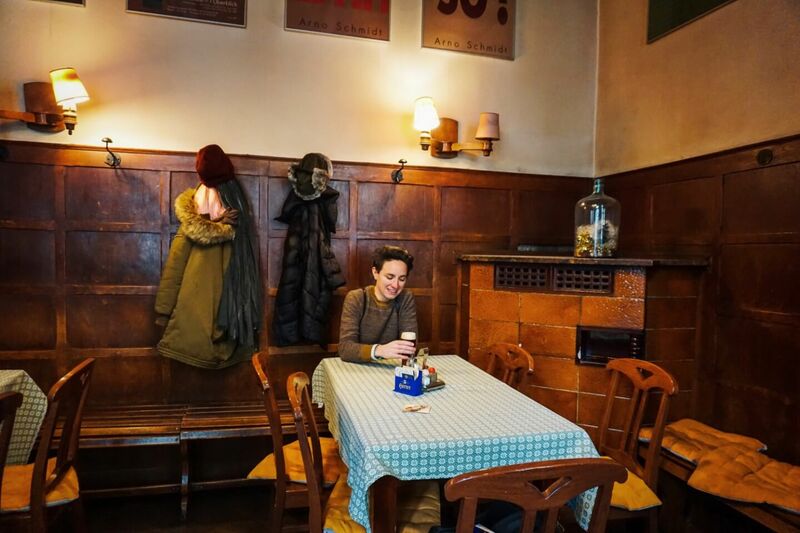 You’ll also find the restaurant-bar Statt-Beisl in WUK, a true hidden treasure in Vienna. They have 11 beers on tap and you can order a beer flight of 4 beers (.15) for 7.90 EUR. Their menu features Austrian classics as well as some Asian-fusion dishes. How to Get to WUK? Krypt is a speakeasy-style bar in the 9th District. The bar is so well hidden that you might have a difficult time locating it (at least we did). Krypt’s inconspicuous entrance adds a bit of excitement to the experience, or frustration (depending on who you ask). When we arrived on a weekday, we had to ring the doorbell to be let in. However, on the weekends, there’s probably a bouncer. As soon as you enter, you can hand over your heavy coats, before proceeding downstairs. The bar is stylish and well-designed. Dim lighting warms up the interior brick walls. A striking modern painting serves as the backdrop of the working mixologists. And, a long wooden table extends from the bar, providing guests with a communal-like seating arrangement. As you sip your inventive cocktail, you’ll relish Krypt’s secretive atmosphere. And, perhaps, you’ll be inspired to linger all evening. 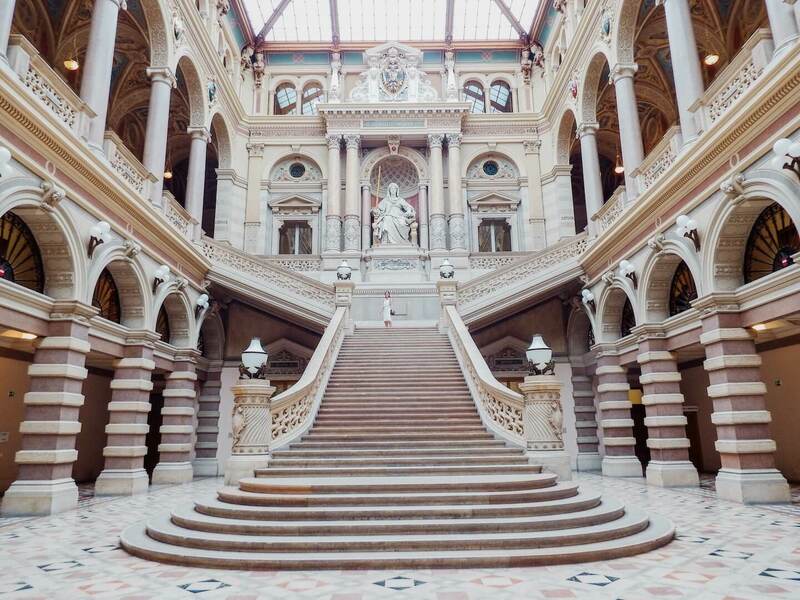 The Palace of Justice (Justizpalast) is a beautiful Neo-Renaissance building in Vienna and serves as the seat of the Supreme Court of Austria. The stunning interior features a glass ceiling, symmetrical arches, a melting staircase and a statue of Lady Justice. Though the building is open to the public, you‘ll have to pass a security check. So, most people never venture inside this Vienna hidden gem. After admiring the interior, head to the top floor to the Justizcafé for a bite to eat, or a drink. The cafeteria-style Justizcafé also offers a great view of Vienna. When to Go: Monday – Friday, between 7:30 a.m. and 3:30 p.m. The building is closed on the weekends. This lovely wine establishment is tucked away from the street. The only indication that the wine tavern is open is by the illuminated lantern hanging above the entrance. We found this Vienna hidden gem by accident, and we’re so glad we did. While many restaurants and cafés in Vienna feature outdoor seating, most dining spaces are located along the street. 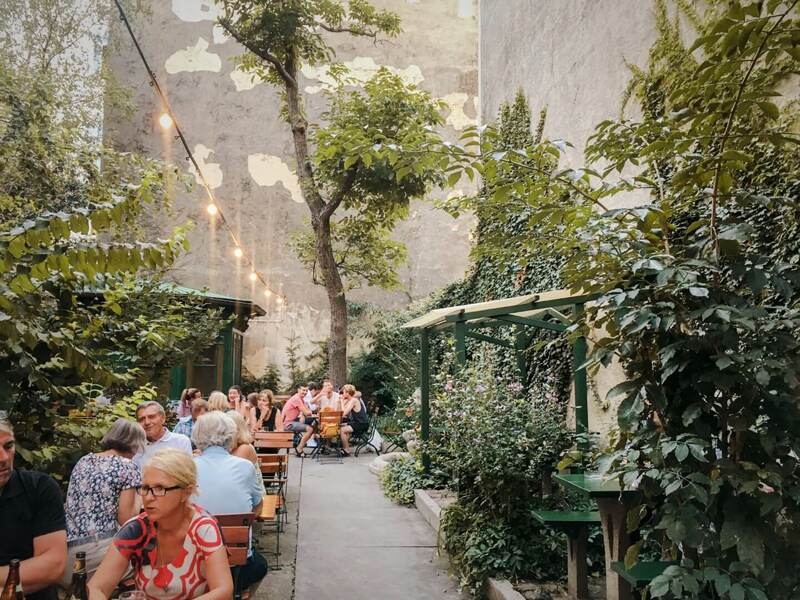 Weinstube Josefstadt has a beautiful outdoor seating area in an urban garden environment. Come here for wine, or beer and heuriger-style food. When to Go: Open daily from 4:00 p.m. – 12:00 a.m. (16 bis 24 Uhr) in Spring, Summer, and Fall. Closed during winter months: January, February & March. Augustinerkirche (the Augustinian Church) is a parish church located at Josefsplatz, next to the Hofburg. On Sundays, you can experience the Catholic High Mass. In this type of service, almost everything is sung. 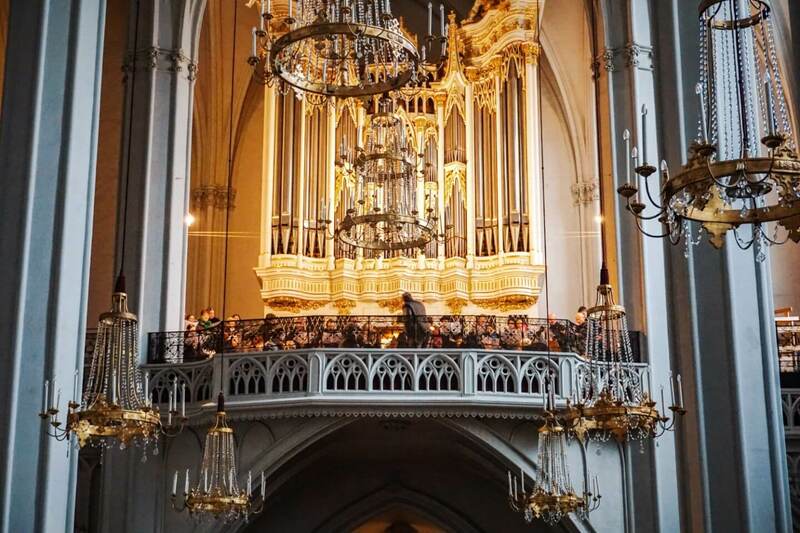 We recommend attending a solemn high mass at Augustinerkirche, because of the incredible orchestral and choral music. The church choir, orchestra, and organ elevate the service to a work of art. As the soloists’ voices rise up to fill the cavernous space, there’s something really moving and celestial about the experience. We attended the Dreikönigshochamt (Three Kings High Mass) and heard J. G. Rheinberger’s Missa solemnis C-Dur (C-Major). You don’t have to be a Catholic or Christian to appreciate the music and the performative ritual of the ceremony. You also don’t have to stay the whole service, which can last 1.5 – 2 hours. Just take a seat towards the back of the church, so you can exit easily. If you want to have a seat, we recommend showing up 20 minutes before the mass begins. We read that you should show up an hour before (which we did), and that wasn’t necessary. Schedule: High Mass Schedule at Augustinerkirche. Here you can see what masses (music) are being performed on which days. E.g. WA Mozart: Small Credo Mass, J. Haydn: Nicolaimesse, G. Puccini: Messa di Gloria. Entrance: Free. The church asks for a donation of 8 EUR to support the music and ongoing costs of maintaining an orchestra, soloists, organist, and conductor. 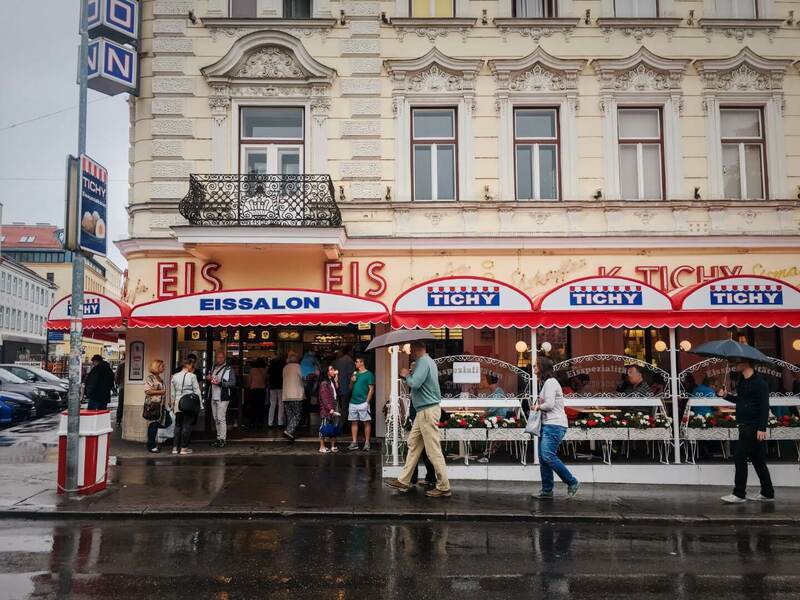 Tichy is a family-run ice cream parlor in the 10th District (Favoriten) and arguably Vienna’s best-kept secret. Tichy occupies a special place in the city’s collective heart. Here, dessert is the main course and you’re invited to spend a whole afternoon indulging. The old-fashioned interior is reminiscent of the 1960s. Tichy’s menu features an extensive list of specialty ice cream sundaes. However, it’s the original ice cream- apricot dumplings that locals go nuts for. Opening Hours: Daily from 10:00 a.m. – 11:00 p.m. Tichy is closed in Winter. Depending on the weather, Tichy is open approximately from Mid-March to end of September. Vienna is renowned for its Art Nouveau and Baroque architecture. It’s definitely not celebrated for its modern architecture. But, we have another Vienna hidden gem for you. 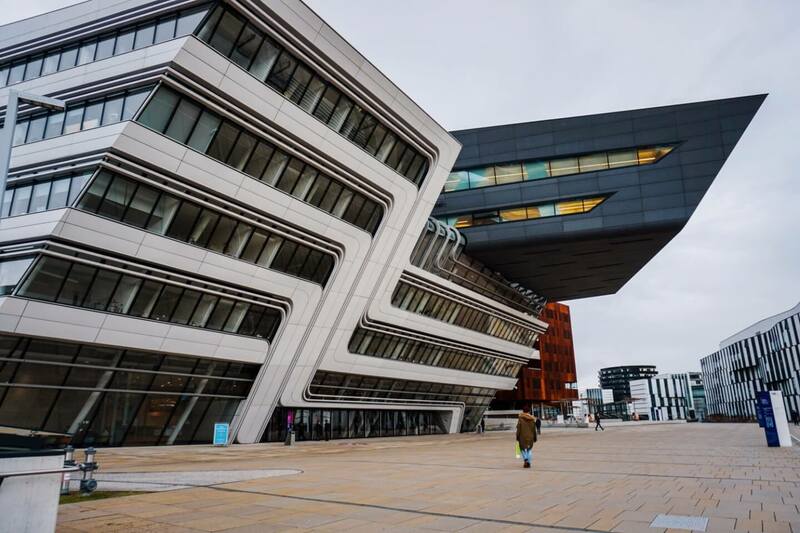 The WU campus is one of the most impressive modern building complexes we’ve ever seen. Walking on the campus, you’ll see a myriad of different shapes and designs that seem to play off each other. It’s a visual feast of color and texture that seems to go on forever. Standout buildings are the Library & Learning Center (LC), Teaching Center, and D3 Department and Administration building. The WU campus was designed by 6 architects. If you want to learn more about the buildings, you can request an Architecture Tour. It looks like tours are only available for groups, but you can reach out to office@atours-vienna.at for custom tours. How to get to WU: Take the subway U-2 to Messe. Gasthaus Quell is the perfect place to go if you want to eat traditional Austrian food in a very authentic restaurant. The interior is warm and cozy and the service is always friendly. If you’re in Vienna during a weekday, this is a great place for lunch. We hit up this Vienna hidden gem everytime we’re in the city, and our experience is always exceptional. Without fail, Kati always orders the Augsburger gegrillt mit Rösti & Salat, which is a sausage paired with hashbrowns (Rösti) and a side salad. Opening Hours: Monday – Friday: 11.00 a.m – 12:00 a.m. (24 Uhr). The Kitchen is open from 11:00 – 10:45 p.m. Closed weekends and holidays. 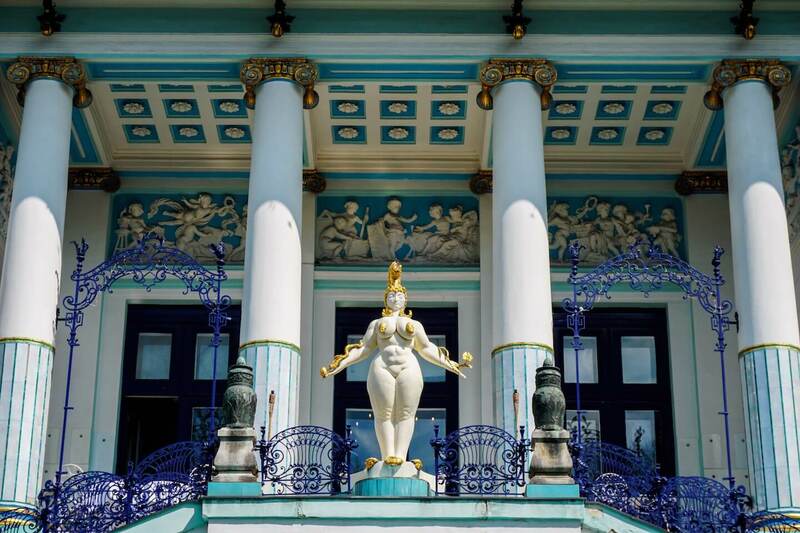 The Ernst Fuchs Museum occupies the fanciful Otto Wagner Villa in Vienna’s Penzing district. Otto Wagner (1841-1918) was a visionary architect in the late 1800s. His designs have left an indelible mark on Vienna. If you’re in the inner city, you’ll likely encounter his work at the city railway stations (Wiener Stadtbahn), the Postal Savings Bank (Postsparkasse), and the residential buildings at Linke Wienzeile, which are next to Naschmarkt. One of Otto Wagner’s buildings, named Otto Wagner Villa I, is rarely visited. This hidden gem is a fantastic display of the Viennese art nouveau movement. 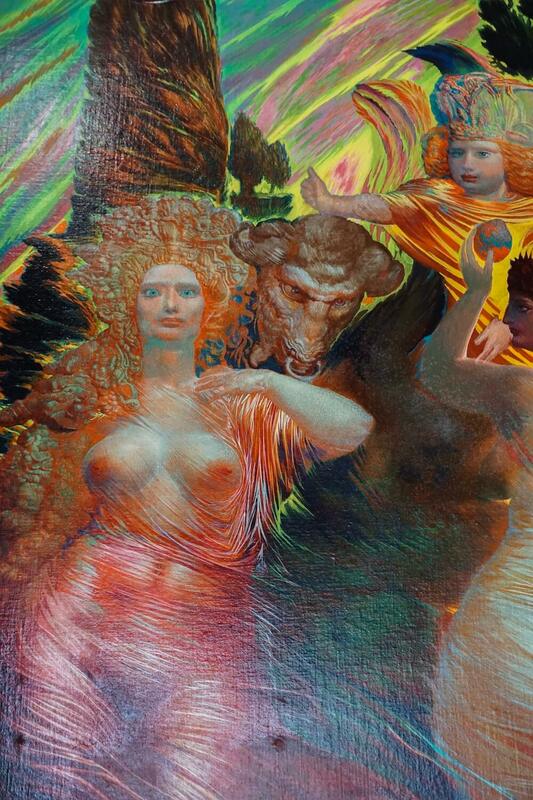 Today, the Villa houses a collection of Ernst Fuchs’ (1930-2015) paintings and drawings. Fuchs’ art is both beautiful and grotesque. His use of color is almost psychedelic. He drew great inspiration from the Secession movement and both religious and mythical themes. Though there’s no information about the artist in English in the museum, we still think it’s worth visiting. 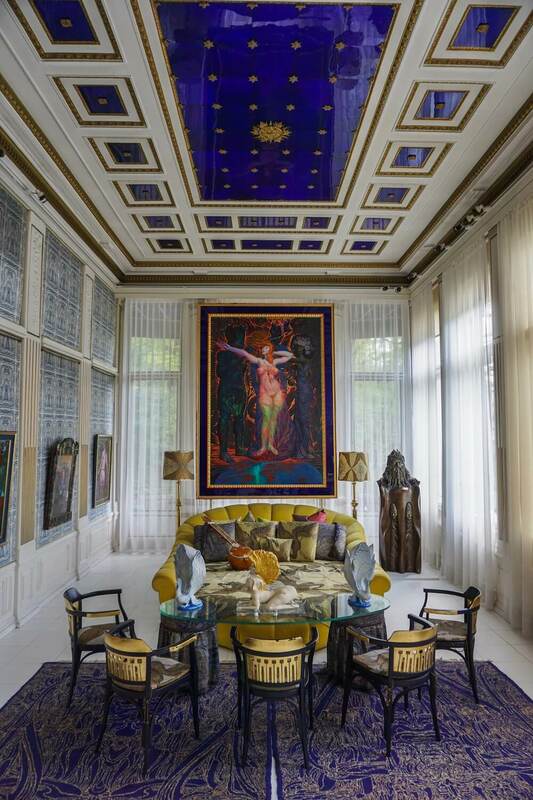 On a sunny day, light streams into the villa and illuminates the intoxicating works of Ernst Fuchs. Entry: Adult 11 EUR, Wiencard: 8 EUR, Students and Seniors 6 EUR. Budget | H+ Hotel Wien opened in 2018 and offers dormitory and private rooms. A great breakfast is included in the room rate. 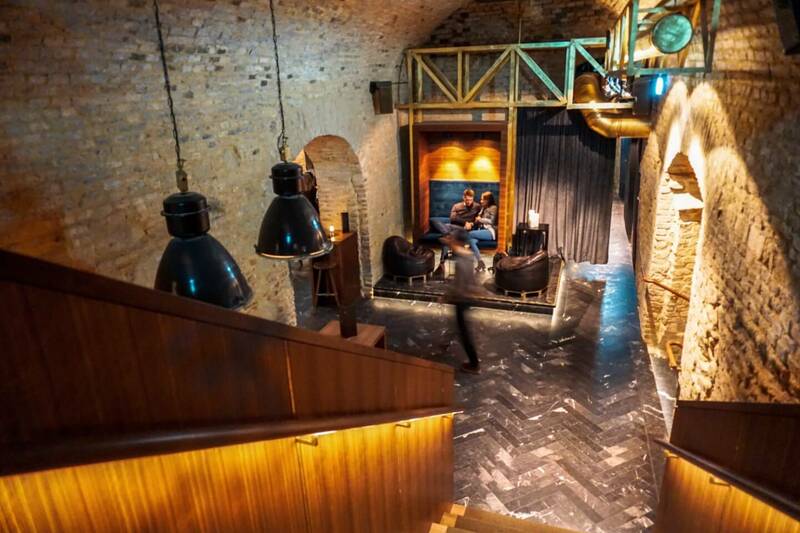 It’s a 30 min walk to the city center and walking distance to the hidden gems: Schlumberger Cellar World, Krypt bar and WUK. Mid-Range | Landhaus Fuhrgassl-Huber is a wine-growing estate located in Vienna’s Neustift am Walde region. Surrounded by wine taverns, this hotel is a great option for those that want to relax and go wine tasting. Guests have access to a terrace, sauna, infrared cabin, fitness area. It’s a 30-min ride by public transit to the city center. Breakfast included. Luxury | Schreiners Essen und Wohnen is a cheerful hotel with an on-site Viennese restaurant and private garden. Rooms are spacious and comfortable and surrounded by lush greenery. It’s highly recommended to eat dinner in this charming oasis (make a reservation). Breakfast is included in the room rate. We were guests of Schlumberger Cellar World for our audio guide tour and wine tasting. All opinions are our own. Oh how I love Vienna. I've been loads of times. But truth to be told, I've seen hardly any of the places you mention in your post. So well worth the read and will ensure I visit one or two next time I go to Vienna. Thanks for the inspiration. What a great list. I still need to go to Vienna so pinning this for future reference. The Cellar World and Krypt bar are my favorites from this list. I love this post! Vienna looks like an enchanting place and I am hoping to go one day to visit the Christmas markets! Will definitely save this post to plan my trip! This is by far the best Wien guide ever. I used to live in Wien for a while but only been to one of these places. As I keep coming back, I’m running out of the ideas what else to see. So this is just perfect! Thank you for this, for real!! !